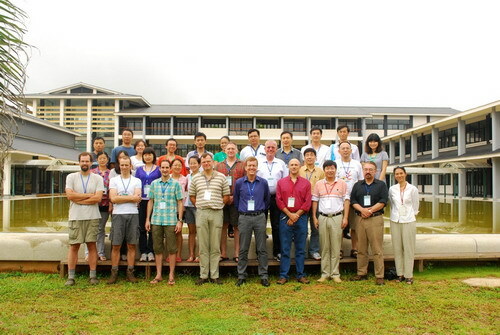 WTBG@XTBG 2011 was a great start to an exciting new era in tropical biodiversity research in the Chinese Academy of Sciences. The workshop was organized into a series of excellent research talks presented by leading scientists and participants. Several working groups focused on transcriptomics, comparative genomics, reference-free analysis, and the detection of selective elements. The participants also discussed future directions, possible collaborations, and the structure of upcoming proposals. Invited speakers included Mike Arnold (Kunming Institute of Zoology and University of Georgia), Jeff Boore (Genome Project Solutions and University of California at Berkeley), Chuck Cannon (XTBG and Texas Tech University), David Galbraith (University of Arizona), Rhett Harrison (XTBG), Chai-Shian Kua (XTBG), Christian Lexer (University of Friborg, Switzerland), Hendrik-Jan Megens (Wageningen University), and Yann Surget-Groba (University of California, Santa Cruz). Three participants also gave presentations one evening: Ruan Jue (Beijing Institute of Genomics), Ye Cheng-Xi (XTBG), and Ye Sun (South China Botanical Garden).